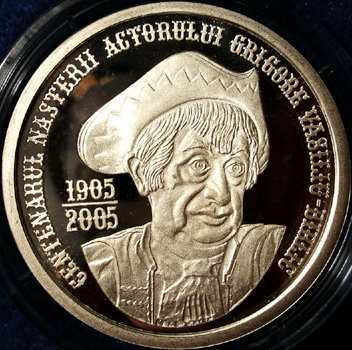 The great theater and movie player Grigore Vasiliu-Birlic (1905 - 1970) was born at Fălticeni, in the county of Suceava. He graduated the Faculty of Law and the Dramatic Art Conservatory. He performed brilliantly and very innovatively a lot of roles in comedies as "D-ale carnavalului = Of Carnival's", "Conu Leonida faţă cu reacţiunea = Master Leonida versus Reaction", "O scrisoare pierdută = A Lost Letter" by the Romanian dramatist and writer Ion Luca Caragiale, "L'Avare" (English title: The Miser) and "Le Bourgeois gentilhomme" (English title: The Prodigious Snob) by the French dramatist Molière. His performance was characterized by a strong personal color, by an inimitable intonation and by a minutely delineation of the comic details. Grigore Vasiliu-Birlic also played in some great Romanian movies: "Telegrame = Telegrams", "Două lozuri = Two Lottery Tickets" or "Titanic vals = Titanic Waltz". After our information, Birlic (meaning in Romanian the ace at the playing cards) is a surname or a nickname, received by the actor after one of his roles. The actors wear masks from the ancient Greece times. The legend says that the Greek poet Thespis invented the masks in the 6th century BC. The masks were used in order to play the feminine roles (only a man could be an actor!) or several different roles (in the Greek tragedies only three actors could perform! the first or leading actor being named protagonist, the second, deuteragonist and the third tritagonist). The public recognized more easily and from a greater distance the played character by the masks depicting standard personages. In time the masks came out of use. In our times the masks are employed only as an exception. Nowadays the masks of Tragedy and Comedy are a common symbol of the theater. 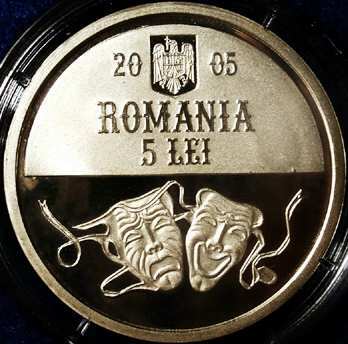 The silver coin pictures above (struck in an outrageous mintage of only 150 pieces) are present on the site through the kind permission of Mr. Radu Lissner.